The second largest of the Canary Islands but with one of the smallest populations, Fuerteventura is best known for its extensive golden sandy beaches. As a result, Fuerteventura is a favourite for beach lovers, and many of the beaches away from the built up resorts are considered to be unofficial nudist beaches. In recent years, the island has developed its facilities for water sports. These include sailing, surfing, wind surfing, and kite boarding. The night-life has also developed on the island - so the sufers and wind surfers should not be bored after dark. Traditionally on the island, apart from agriculture where possible on the dry landscape, local crafts including pottery are to be found. There are also several museums to be found. At the north eastern tip is Corralejo where a ferry lands from Lanzarote. Closeby is a very wide golden sandy beach, which is now protected at the Parque Natural de Corralejo. The golden sand blew here from the Sahara Desert and is still liable to blow in the wind. 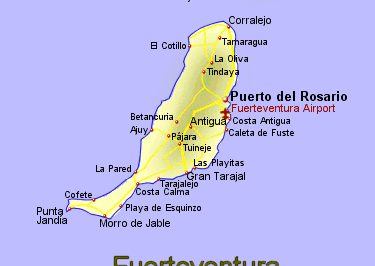 Further south on the eastern coast is the island capital, Puerto del Rosario, which used to a small town in a goat farming area, with a harbour from where goats were exported. Infact, it was called Puerto de Cabras (Goats Port), until it's name was changed in 1956. There is still an old quarter by the harbour with narrow streets and tradition houses but it is mostly a small commercial city now which has been the island capital since 1835.